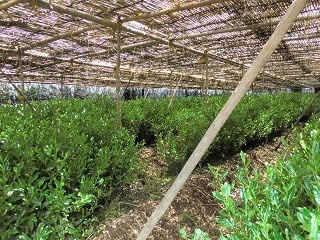 According to the survey conducted by the Ministry of Agriculture, Forestry and Fisheries, the production of “covered tea” has increased. It refers to the tea which is covered for a certain time before the leaves are plucked so that the tea can remain theanin, the source of Umami, instead of creating more catechin, the source of bitterness. The covered tea include “*tencha”, “gyokuro” and “kabusecha”. Since the covered tea is thought to be a value-added tea, many tea-producing areas have been producing more. This trend toward more Umami and less bitterness may continue…. *Tencha is the tea before being ground by a stone mill into powder. This powdered tea is called “matcha”.